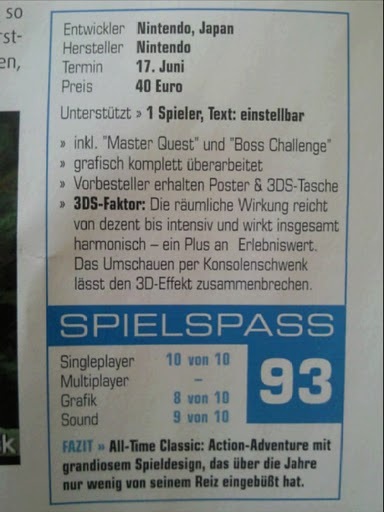 A few weeks back we reported on what was the first official review for Ocarina of Time 3D, in which the German edition of GamePro magazine gave the game a 93%. 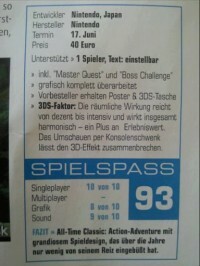 Well, another German game reviewer got their hands on Ocarina of Time 3D as well and they too gave the game a 93%. Thanks to a translation by a commentator over at GoNintendo we can see what was actually said. -Includes Master Quest and Boss Challenge. -Pre-ordering gets you a poster and a 3DS carrying bag. -The depth effects are sometimes subtle, sometimes intense and appear well-balanced – a positive aspect. However it gets broken as soon as you move the actual handheld when targeting or looking around. Verdict: All time classic. An adventure with a superb design, which has only lost a tiny bit of its appeal over the years. Overall this another positive review, although the game reviewer seemed to have issues with the 3D effect when used alongside the Gyroscope. I wrote my impressions of the Gyroscope and the 3D effect after my hands on demo and had very similar issues. I’d like to stress that both features are pretty sweet independently, and most gamers probably won’t have any issue with them at all. For those that do have some trouble though, thankfully they are both fully optional features and can be turned off if so desired. It’s really nice to have options as we can customize how we want to play the game. Additionally, it seems the folks in Germany are getting some sort of 3DS carry bag. This is yet another pre-order giveaway that we can add to the growing list. Still though, we haven’t heard anything from Nintendo of America on whether or not any goodies will come packaged with Ocarina of Time here in the states. The game is set for release on June 19th and we’ll surely be updating on any news that comes out of Nintendo, so stay tuned! Until then, feel free to post your thoughts in the comments below.